A rare solar eclipse allowing a view of the Sun that is totally or partially blocked by the Moon has taken place. It was first visible in the southern United States, before sweeping east across the Atlantic Ocean and the African continent. The US space agency, Nasa, said the greatest total eclipse occurred over the Atlantic Ocean. 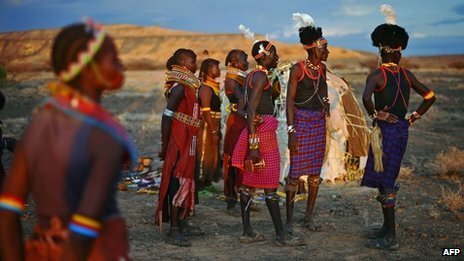 One of the best views was in northern Kenya, where tour companies organised trips to view a total blackout. Local myths there attribute the event to the Moon eating the Sun. Partial views were available in eastern North America and southern Europe. This solar eclipse was a rare occurrence in that it was “hybrid” – switching between an annular and total eclipse. In a total eclipse, the Moon completely covers the sun, while an annular eclipse occurs when the Moon is at its farthest from the Earth and does not block out the Sun completely, leaving a halo of sunlight still visible around the Moon. 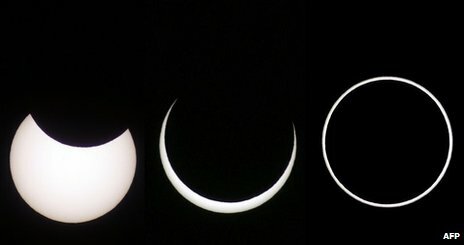 The eclipse event began about 1,000km (620 miles) east of Jacksonville, Florida with an annular eclipse visible for four seconds at sunrise. As the Moon’s shadow raced east the eclipse switched from annular to total along a narrow corridor. The greatest total eclipse occurred in the Atlantic Ocean, approximately 330km south-west of Liberia, and lasted for more than one minute. The eclipse continued across Africa through the Congos until it passed through northern Uganda and northern Kenya, ending in southern Ethiopia and Somalia. Either side, a partial eclipse was seen within a much broader path including eastern North America, northern South America, southern Europe, the Middle East and Africa. Experts warned that no-one should attempt to view the Sun with the naked eye. A safe view of eclipses can be obtained by using special welder’s glasses or a pinhole camera.